Kimberly Vrudny is an associate professor of systematic theology at the University of St. Thomas in St. Paul, Minnesota, where she has taught since 2001. She is the author of Beauty’s Vineyard: A Theological Aesthetic of Anguish and Anticipation (Collegeville: The Liturgical Press, 2016) as well as author or co-editor of three other books on theology and the arts. She served as an assistant and associate editor of ARTS for sixteen years before becoming the journal’s senior editor in 2013. In July, I was able to participate in a faculty seminar sponsored by CIEE (Council on International Educational Exchange), with a grant made available through our Office of Study Abroad and matched by the recipient’s dean—for me, the College of Arts and Sciences. I had applied to the seminar on “Ruin and Revival: Memory and Identity in Poland and Germany After the Holocaust” for reasons both professional and personal. Professionally, I have arrived finally at the study of World War II circuitously, through South Africa, knowing that leaders of the apartheid movement were intentionally drawing upon the playbooks of the failed Nazi/Aryan project in Germany in order to try them out on African soil. My interest extends beyond research into teaching, for I am hoping to teach a study abroad version of our course on “Christianity and Nazism” perhaps as early as January 2019. Because of my participation in the seminar, I have a much better angle from which to approach such a task, having now visited both Poland and Germany. I have a feel for the lay of the land, so to speak, and am prepared to design a course. The trip was also a personal one. I have been thinking a great deal about memory and identity, not only because of identity politics, which figure prominently, and rightly so, in American life these days, but also because the intersectionality of ethnicity among other identities and relative access to economic security increasingly informs how I teach theology. The trip to Germany and to Poland enabled me to come to a deeper understanding of my own multiple identities. My father’s side came to America from Germany; my mother’s side came from Poland. As was the custom, most of our German and Polish cultural identification was lost, increasingly subsumed by our American identity. Yet “being Polish” was still evident to me when I was growing up in Minnesota. My mother’s father emigrated from Poland to America in 1913, when he was twelve years old, in order to reunite with his mother (who had emigrated in 1908) and with his father (who had emigrated with two of his siblings in 1909). The man who would become my grandfather had stayed behind to care for his sister, who may have had tuberculosis. In America, the family at first identified strongly as Polish, even though the ship manifest shows that they came from Austria—something that has only begun to make sense to me recently, once I began to study maps from the period, and to learn of the various partitions of the land this family knew once as home. My mom and my Polish aunts and uncles often told some of the same jokes I heard our hosts tell in Poland (which made this foreign country oddly familiar), and our family faithfully prepared pierogies each Christmas and New Year’s. They made only potato and sauerkraut pierogies, the food of Polish peasants, I came to understand on my trip. Beyond the presence of the concentration camps in Poland, I had no idea about the destruction being experienced by Poles for the last centuries, or for that matter the destruction of the Catholics in Poland, whom Hitler despised with great zeal because of the resistance movement emerging especially out of Warsaw, a predominantly Catholic city. 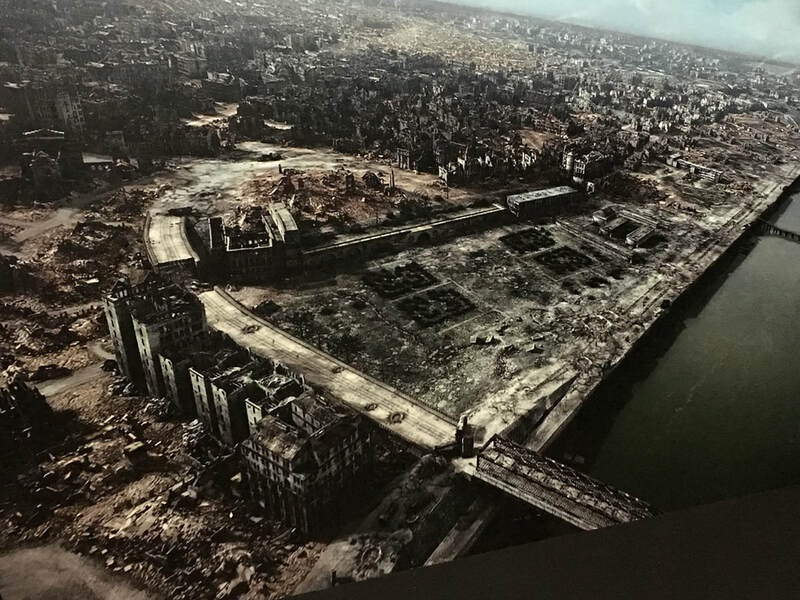 It had 1.3 million inhabitants before the war, and only 1,000 in 1945, the year Hitler called for its destruction (see photo on page 4, taken by the Soviets after the German bombing campaign in 1945). There are rumors of Judaism in the background of my family somewhere, traced also through my mother’s line, whose last name has Hebrew roots. The village from which my grandfather came was 46% Jewish in the early 1900s, as it was located in the Pale of Settlement where Jews were allowed to settle in the 1800s. Somehow, I carry all of these national identities and stories in my being—and this shapes anew how I understand myself. I think I most appreciated our time in Warsaw, where I was learning so much both about the history of Poland during the Second World War, and about my family’s background. It was in Warsaw that I learned more about the period of the partition of Polish lands into Prussia, Russia, and Austria, and then of Poland’s recreation after WWI as well as its destruction again during WWII, and of the West’s betrayal of Poland after the war. 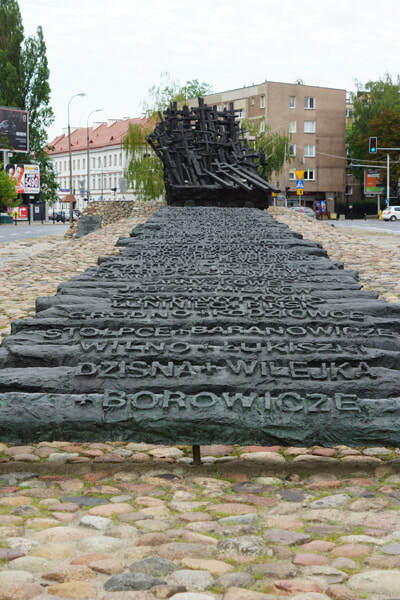 It was also in Warsaw that I learned about a resistance movement that I had not known existed, and of deportations of ethnic Poles to Siberia. This history had impacted significantly my own family. My great-grandmother’s sister, husband, and two of three children were sent to a gulag in 1941, a fate that could have been my great-grandmother’s had her father not sent her to America in 1908. (Jan, the son that was left behind, watched his family being taken by Soviet soldiers as he hid behind a pile of lumber.) They were freed from the labor camps in Siberia only after the Polish prime minister in exile reached an agreement with Stalin to create an army under the Polish General Anders, and to fight Hitler. Jan’s father became a soldier in that army, and after his training in Palestine, a British colony at the time, he fought at the Battle of Monte Cassino. His wife and children were liberated and were sent to Uganda, and they were eventually reunited in the United States. However, because of the establishment of the Iron Curtain, Jan would never see his parents again. I am especially grateful that in my free time, I was able to visit the Monument to the Fallen and Murdered in the East—a memorial to those like my relatives who were forcibly removed from Poland and taken to gulags in Soviet Russia. There are important lessons tucked in this story somewhere, about courage and bravery and taking risks, and about how decisions can alter your family’s path for good and for ill, since no one can see the future clearly. From Kraków, we went to Auschwitz—the first concentration camp I have ever visited. It was a difficult albeit educational day, as questions I had puzzled over—questions about differences between concentration camps, death camps, and labor camps—started to become clarified. I wish I had thought to look for my mother’s maiden name, Safratowich, or Szafratowicz, in the Book of Names. But I hope to return at some point, and if I return to Warsaw, I would like to see the Monument built to commemorate the Battle at Monte Cassino. It was remarkable to be so close to all of this, with comprehension of this period’s impact on my extended family only slowly emerging. After visiting Auschwitz, I spent the evening alone in my room. I drew a picture superimposing two images that remained in my mind after being there. I remembered the wreath in the shape of the Star of David. And I remembered the railroad tracks. I drew the star of David on a sheet of paper, and had the tracks fall as if a shadow were being cast behind the star, extending into the horizon, imitating the horizon at Auschwitz. One track went straight into and out of the camp, but there was also a track that turned, veering off in a different direction. This track came to represent for me the possibility of making different choices, as the guide said so profoundly when our tour at Schindler’s Factory had ended, when we stood in the Room of Choices, I think he called it. On my drawing, before the star of David, genocides are listed that precede the Shoah: the genocide of the Canaanites, of the indigenous in America, of the indigenous in Australia, of the Armenians, to name just a few. And on either side of the star of David, I drew two simple images, the first a candle, the second a horn. The first of these is an allusion to Elie Wiesel’s comment in his preface to Night that his people made only one mistake, and that was to believe in the innate goodness of humankind. If only they had not believed that all humans are created in the image of God and carried in them the light of the Shekinah’s flame, he said, they would never have stepped onto those trains. The second image, this one of a horn, is a reference to something that Desmond Tutu once said about human nature: that everyone, all of us, have in us the capacity to be monsters and monstrous given the right social and historical conditions. I sense deep truths in what both men are saying. And I know that all of this has to do with choices—choices that are sometimes difficult and frightening to make. Would I protect or hide a persecuted family in my home, if history repeats itself in the United States? Such unthinkable questions haunt me. Behind the star of David and over the tracks in my drawing, I drew the “Arbeit Macht Frei” sign that marked the entry to Auschwitz. I drew different versions. In one, I wrote “Ruin and Revival,” after the name of our seminar, with the sign broken in the middle. In another, I wrote “Interruption,” also broken, recalling the term used by theologian Johannes Metz to warn that all Christian theology must be rethought after the Shoah. Beneath the sign, I drew mounds of broken bricks, each one engraved with a word in a crescendo of destruction: Christianity, fanaticism, fundamentalism, complacence, injustice, victim, capitalism, communism, socialism, complicity, bystanders, struggle, memory, diaspora, classism, ignorance, sexism, intolerance, antisemitism, heterosexism, perpetrator, hatred, evil, Poland, Germany, Russia, deception, ugliness, Hiroshima, Nagasaki. 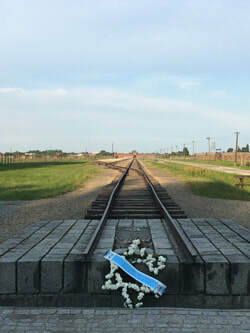 We say “never again,” a line we repeat time after time, yet the tracks in the distant horizon are littered with genocides after the great war: in the Congo, in Somalia, in Guatemala, in Tibet, in El Salvador, in Bosnia, in South Africa, in Chechnya, in Rwanda, in Iraq, in Argentina, in Chile, in Darfur, in Sudan, in Cambodia, in Palestine, in Viet Nam, and those still ongoing . . . This opportunity for professional development afforded to me through the collaboration of the College of Arts and Sciences and the Office of Study Abroad has me embarking in new directions in my writing and teaching. Interdisciplinary interaction among theology, art, and politics continues to fascinate me, as will remain apparent in the articles we publish in the pages of this journal. We encourage scholars who are thinking about these intersections to send their work for publication consideration. I hope very much that the colleges, universities, seminaries, and schools of divinity where you find yourselves provide funding for similar opportunities—because experiences like these that enable academics to reset and retool are invaluable to the life of the mind upon which all of higher education is ultimately based. Indeed, with this issue of ARTS, we are claiming our place in the academy as an academic journal. Though much that the reader sees should seem familiar—with our regular columns and features, and with elements of our previous design, we are expanding each issue to 100 pages, even as we are reducing the frequency with which issues come out to twice a year, each fall and spring (November and May). We are adopting the smaller format of most academic journals, while maintaining our focus on the visual arts. Our regular columns rooted on theology and the arts “in the study,” “in the sanctuary,” “in the studio,” “in the gallery,” and “in the classroom,” are expanding to include theology and the arts “on the street,” which will debut in our next issue. In every issue, we will continue to publish on theology and the arts “in poetry,” and “in review,” including our popular “on the shelf” section with book notes on recently released titles treating theology and the arts. Moreover, in every issue, we will include a portfolio of images by an artist whose work intentionally references religious or theological ideas. In this issue, we are introducing the portfolio section with Cory Dugan’s Gospel series entitled “Hapax Legomena,” a Greek phrase referring to words that appear only once in a text. About these anomalies, Dugan comments, “Except for the ones found in the Gospel of Luke (it’s a little amazing and befuddling how many appear in that single book), the hapax legomena are relatively spare in number—only 89 in Matthew, 67 in Mark, 388(!) in Luke, and 68 in John. When I was making the works, these Greek words seemed to want to float haphazardly on the picture plane with a kind of casually realized symmetry. So that’s what I allowed them to do, weaving in and out of cloud-like layers of gouache and spray paint and oil pastel, tangled up in the lines of a grid, and sometimes subsumed by the heavier weight and rigid structure of superimposed floorplans and maps and mosaics.” Next, poetry editor Mark Burrows curates four poems by Barbara Crooker, Philip C. Kolin, Susan Miller, and Suzanne Underwood Rhodes. Randall Lindstrom provides a tribute to the late Rev. Dr. Patrick Negri, an Australian priest and artist who was a longtime friend of this journal and its society (see Negri’s articles in 4.2, 8.3, 13.2, and 15.2). Mark Burrows’ article, “Seeing Through Words,” which is on poetry as a visual art, also appears in this issue. Matthew Plescher’s work is featured in our “in the studio” section, and Tonia Colleen Martin is “at the drafting desk,” exploring writing as an act of incarnation in a more experimental way. John Shorb interviews Meg Hitchcock, whose work is featured on the cover of this issue; Wilson Yates reviews a title by Aaron Rosen; and Mark McInroy wraps up the issue with notes on three recently released titles in theology and the arts. Participation in the faculty seminar overseas, where we visited more than twenty museums, monuments, and memorials over twelve days, and studied how curators are constructing memory and identity after the Holocaust, has reinforced my commitment to interdisciplinary, even transdisciplinary, scholarship. ARTS is a place where artists, theologians, and clergy can find an audience receptive to a wide range of ideas. Welcome to the next generation of ARTS.